Who hasn’t sneakily checked the property price register after a neighbour’s property is sold, or to see what a house you bid on some years ago eventually sold for, or to satisfy your curiosity on what a friend paid for her new house? Maybe it makes you feel more confident, or wise to have bought, when you see that property values in your area are rising; or maybe it fills you with despair as prices seem to be on an inexorable rise. Some might argue that we’re obsessed; even the most generous would suggest that the Irish have a “healthy” interest in property. But despite the interest and importance we ascribe to property prices, who’s to say we’re valuing them correctly? If you think about it, the Irish market has had two distinct characteristics in recent years: a high proportion of owners who could not sell and, subsequently, a very low level of transactions relative to historical norms. Combined, could these still be creating artificial price levels, with market values obscured by low sales figures and trapped owners? What is a market value? Properties typically sell based on their market value. And, according to international valuation standards, market value is defined as “the estimated amount for which a property should exchange on the date of valuation between a willing buyer and a willing seller in an arm’s-length transaction after proper marketing wherein the parties had each acted knowledgeably, prudently and without compulsion”. But when it comes to property, there are several factors can mean that this true “market value” can be somewhat obscured. Low transaction levels can make it more difficult to price an asset. A house might sell just once in 50 years; contrast this with the Irish Stock Exchange, which reported some 6.6 million equity trades last year. Back in January, the Financial Times queried how price discovery could be valid in a market such as property which is “deeply illiquid”. 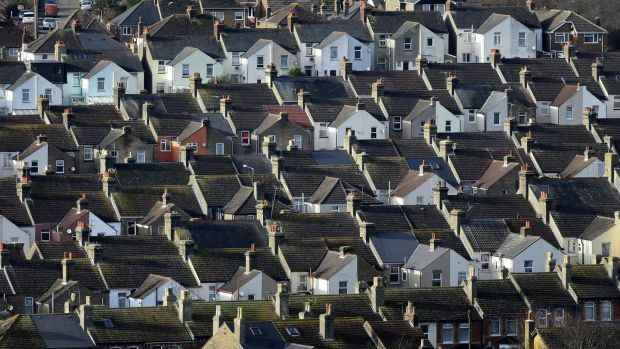 And it noted that “just 4.5 per cent of the UK’s housing stock changed hands last year”. Here in Ireland, we’re far below even those heady transaction levels. As the Central Bank wrote in a report some years ago, transaction levels of about 50,000 a year are too low. “This equates to a rate of turnover of around 2.5 per cent of the stock of housing. International commentators suggest that a well-functioning housing market should see 3 to 4 per cent of its stock turn over every year,” the authors of the report wrote. 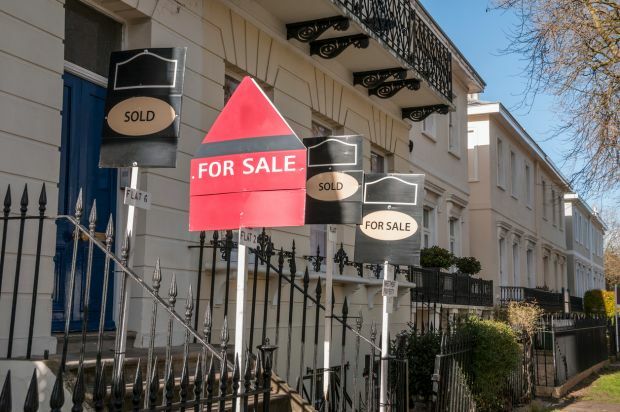 A report from Savills last year found that Ireland has had far fewer residential transactions per head of population than England Scotland or Wales. Transactions were on the rise last year, beefed up in part by the (muted) recovery in new house builds. In Dublin, for example, the number of house sales rose by 16 per cent to 17,491 last year, according to an analysis by MyHome.ie. Can financial advisers help save investors from themselves? However, they are far off levels seen not just in the boom years, but in those preceding it. Look at Table 2: some 100,000 houses were sold back in 2000, still a fair bit removed from the heady days of 2004-06. Contrast this with 2016, when just about 45,000 houses were sold, or 2017, with about 59,000 sales. And, in particular parts of the State, the lack of transactions may be even more acute. Some 10 years on from the bust, activity remains muted. Dublin 10 saw just 142 sales last year, with just 146 in Dublin 20, and 147 in Dublin 22. Or how about Longford, home to 40,810 people but with just 485 sales last year, or one transaction for every 87 people. Or Carlow, with 600 sales in 2017 – one transaction for every 94 people. And let’s go back to Dublin. Yes, it had more than 17,000 sales last year, but these represent just one sale for every 102 people. There are signs that supply issues could even be deteriorating further. In March, Sherry FitzGerald reported that just 21,200 properties were on the market in January (down by 61 per cent on January 2010), accounting for just 1.1 per cent of the total private housing stock. Of these, 3,100 were in Dublin, accounting for just 0.6 per cent of the capital’s stock. Added to this is the fact that, while property sales are less frequent, they are also far more individual, which again can complicate how much a property is worth. Another contaminating factor on accurate valuations is the presence of cash buyers. For one thing, when a property is purchased with a mortgage, before the bank allows you to draw down the loan, it will undertake its own property valuation. But when it’s a cash-only deal, there is no valuation. 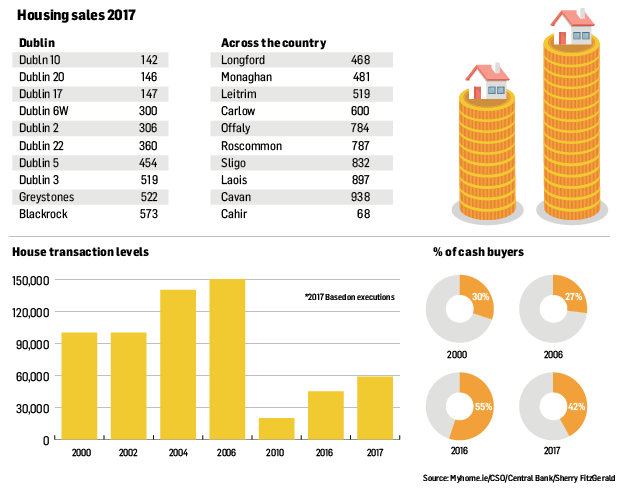 Back in 2000, just 30 per cent of property buyers were cash buyers, Central Bank figures show, falling to 27 per cent in the highly leveraged boom year of 2006. But in 2016, some 55 per cent of sales were cash only. That means that 24,750 properties sold that year will not have been professionally valued, nor about 24,724 in 2017. And, given the move to 20 per cent deposits under Central Bank rules, cash forms a significant part of the payment even when there is a mortgage; so when a bank does do a valuation, is it guided by the amount it is lending or the true value of the property? Unlike other assets, such as stocks and bonds, property has a huge psychological and emotional aspect to it. Homeowners can attach a huge importance to the value of their home, and can be reluctant to sell if they feel the price offered doesn’t match their expectations. Ask any beleaguered would-be property buyer, weary from bidding on houses that never sell, because the owner simply won’t accept a price below the value they have assigned to their property. If you’re buying or selling a liquid asset such as a stock or a Reit (Real Estate Investment Trust), you can simply check the price that morning and make your decision. With property, the value is never certain. And this decision to pull properties – which may have sold for less if the transaction actually went ahead – can act as a distortion on property values. Now let’s extrapolate that point to include would-be sellers who would have sold, but couldn’t because they were in negative equity and selling their homes or investment properties would have meant taking on substantial personal debts to cover the shortfall. At one point, there were more than 300,000 Irish homes in negative equity; if even a proportion of these had made it to the market, could they have had a depressive effect – even greater than was seen – on market values? And what about the level of distressed sales? Yes, homeowners were undoubtedly forced to sell during the boom years, as evidenced by the number of receiver sales and cut-price auctions, but the levels may have been much lower than expected. Forbearance measures, such as interest-only repayment periods, and other temporary deferral of or reductions in the repayment amount, combined with the difficulties the banks encountered in repossessions, has meant many properties that would/should have been sold, weren’t. Does this mean that values would have fallen more than they did – and, peak to trough, they did fall by about 54 per cent, according to the CSO – if more distressed property had made it on to the market? This also brings us back to the banks. Higher property prices equals better loan-to-valuation metrics on their books, which frees them up to lend more. Something else to think about. Finally, it’s worth bearing in mind the impact subsidies can have on property values, such as those arising from the Help to Buy scheme, or affordable home loan scheme. If you look to the UK – where its Help to Buy scheme has been around since 2013 – a report from Morgan Stanley last year found that it has had a significant impact on new house prices, noting that “the divergence between new-build and second-hand prices is higher than it’s been since records began”. Given that our first-time buyers scheme was only launched in 2016, it’s hard to draw too definitive a conclusion on how it’s impacted, although, pointing to early evidence, Sherry FitzGerald says that the median value of a new home fell by 3 per cent in 2017 compared to the prior year. However, even if it’s not exerting upward pressure, is it protecting values? The question, perhaps, to ask is how much these houses would be selling for without such subsidies.